edited by Neil Gaiman This time around, editor Gaiman provides a selection that is heavy on excerpts of graphic novels rather than self-contained works. His picks include, as one would expect, the most celebrated works of last year: R. Crumb's Book of Genesis and David Mazzucchelli's Asterios Polyp. ; but there are some surprises, as well. In fact, the book starts out with the biggest surprise of all: and actual Marvel Comic! But wait – hold on, it's not what you think. It's an excerpt from the seventh issue of the Omega the Unknown limited series that was later collected in book form. Written by Jonathan Lethem, this excerpt starts off with the sequence that was drawn by none other than Gary Panter. One can readily see how irresistible this choice was: how could you not include what may very well be the only Marvel comic ever drawn by Gary Panter? Other excerpted works include: the completely necessary Acme Novelty #19; the off-the-radar-for-many, Citizen Rex by Gilbert and Mario Hernandez; Lilli Carré's The Lagoon (Carré was also selected for this year's Best Non-Required Reading); Josh Neufeld's docu-comic, A.D: New Orleans after the Deluge; Carol Tyler's ongoing masterpiece, You'll Never Know; Derf's Punk Rock and Trailer Parks, which we've been trying to convince people to read since it came out; and several others. Every reader of this volume is sure to pursue the purchase – or at least perusal – of at least one of these works in its entirety, and there are bound to be a few who will want them all. 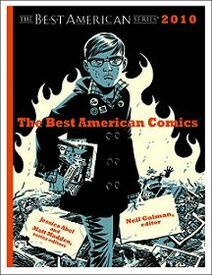 In addition to these excerpts from these graphic novels, there are plenty of short pieces by the like of Ben Katchor, James Kochalka, Peter Kuper, Jesse Reklaw and Gabrielle Bell. Worthy of singling out, is the excellent 14-page "Trinity," by the sorely under-appreciated Michael Cho (who also executed this volume's cover), that originally appeared in the relatively obscure Taddle Creek, and so ran the risk of being missed by most, and so is perhaps Gaiman's single best call. And, finally, we can't go without mentioning that we are happy that a selection from Copacetic favorite, Capacity, by Theo Ellsworth, is also on hand in this volume, and, not only that, but Ellsworth was commissioned to produce original endpapers for this volume as well, providing a visual treat to its opening and closing. This series continues to be a great way to introduce the uninitiated to the wide world of comics, and makes an excellent gift.